Three cyclical phases seem to emerge in the acquisition of self-regulation skills. Where will they do the work? How will they get started? What conditions will help or hinder their learning activities are a part of this phase? Maria, for example, must be helped to think about her algebra homework and reflect on what she can do to be more successful. Is there a better time or place to do her homework? Should she begin it in school with her friends who are doing better than she is in algebra? Should she plan to spend at least five minutes on a problem before giving up and moving on? Should she have a friend standing by to help either in person or on the phone (a study buddy)? Should she ask for a tutor? Phase 2. 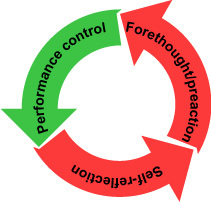 Performance control—This phase involves processes during learning and the active attempt to utilize specific strategies to help a student become more successful. Are students accomplishing what they hoped to do? Is this taking more time than they thought? Under what conditions do they accomplish the most? What questions can they ask themselves while they are working? Maria, for example, has to consider her performance in math as opposed to other content areas. When frustration increases, should Maria stop and take a break? Should she do her math homework first in the afternoon, rather than putting it off until later in the evening? Should she have background music or work in silence? She is supposed to be using and considering the success or failure of some of the strategies she has thought about in phase 1. Phase 3. Self-reflection—This phase involves reflection after the performance, a self-evaluation of outcomes compared to goals. Did they accomplish what they planned to do? Were they distracted and how did they get back to work? Did they plan enough time or did they need more time than they thought? Under what conditions did they accomplish the most work. Self-observation—systematically monitoring own performance; keeping records is a big part of this!! Self-reaction—engage in personal processes (i.e., goal-setting; metacognitive planning; behavioral outcomes); self-administering praise or criticism; rehearsing, memorizing; proximal goal-setting; structuring environment (e.g., change the academic task’s difficulty; change the academic setting, the immediate physical environment; create a study area); asking for help.